A regional consultation on aquaculture feed production and use in Asia-Pacific was therefore conducted by Food and Agriculture Organization of the United Nations in collaboration with NACA and the Thailand Department of Fisheries from 7-9 March 2017. The objective of the consultation was to review and share the knowledge on the current situation of aquaculture feed production and use, in respects of production status, demand and supply, sourcing of ingredients, government policies and institutional support, ongoing progress and development gaps. The consultation also tried to put forward regional strategies and develop a plan of action to promote responsible utilisation of feed and feed ingredients for sustainable growth of aquaculture in Asia-Pacific through sharing of available knowledge, technological innovations and scaling up successful practices and further research and technology development. This collection contains audio recordings of the technical presentations made at the consultation by experts, international organisations, the private sector and governments in the region. The report of the consultation is in press and will be made available for download in due course. Miao Weimin, FAO, provides an introduction and background brief to the Regional Consultation on Responsible Production and Use of Feed and Feed Ingredients for Sustainable Growth of Aquaculture in Asia-Pacific. Thai Union Feedmill's initiatives to address sustainability issues in aquaculture feed ingredients are discussed in this presentation. Over the years, there have been two growing sustainability concerns with shrimp supply chain, namely human trafficking and environmental impacts. Solving these two issues can sometime result in conflicting agendas. This summary outlines CPF’s approach and experience in dealing with the two issues. The most difficult challenge in our experience is in building trust and understanding between the stakeholders, including governments and regulators, fisherfolk, commercial fishermen, suppliers and buyers. However, we feel that CPF is now a pioneer in our programs. The Department of Fisheries is responsible for aquaculture sustainability, including food safety, animal health and welfare, environmental integrity, social and community welfare and regulation of fishing activities across the whole aquaculture supply chain. The Feed Quality Control and Development Division is responsible for registration and certification of feed formulas and monitoring of feed quality. In addition to input controls, end products are also subject to inspection and monitoring, certification and traceability systems. China is the world's largest producer of aquaculture feeds. With the development of aquaculture, the feed industry has inevitably faced some challenges in promoting update of commercial feeds, pollution, use of trash fish, fish meal and fish oil issues, provision of accurate nutrition and feeding, antibiotic residues, food safety, and so on. In order to balance economic and environmental issues the Chinese Government released its 13th Five-year Plan last year. Trends and policy changes relevant to aquaculture are discussed. Decisions on feeding often diverge from scientifically reasonable optima, resulting in excessive nutrient input, low feeding efficiency, self-pollution, high production cost and negative environmental impacts. Innovations in feeding technologies and farming practices to improve feed utilisation efficiency are crucially important for sustainability of aquaculture. 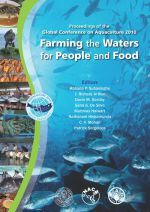 In this presentation the author tries to present some innovative feeding manipulations at farm level, examine some farming systems and practices that favour higher ecological efficiency, and share some thoughts on innovations at farm level. Reducing the dependency of aquaculture on fishmeal is key for sustainable development. Fish meal and fish oil ingredients are not nutritionally required for farmed fish to grow as essential nutrients can be obtained from other sources. Alternative ingredients have been widely used in different countries but are characterised to be inferior in protein content, with unbalanced amino acid profiles and the presence of anti-nutritional factors. Combining alternative ingredients to get the same balance is possible but requires research. Studies on fishmeal substitution have been conducted on many aquaculture species and publications indicate that some can be grown on fishmeal-free feeds with amino acid supplements. Quantities of fishmeal and fish oil in feed formulations have been substantially reduced and it appears that inclusion levels can be further reduced without sacrificing growth performance and utilisation of nutrients. The potential to utilise alternatives to fishmeal and fish oil in aquaculture diets is reviewed and issues and gaps identified.